Our Executive Presbyter, Ralph Hawkins, will be preaching at Jamestown (Nov 29). He will be leading a preaching workshop for ordained and lay pastors in the Iglesia Evangélica Dominicana (Nov 5-7), and will be participating in a COM/CPM training session sponsored by the synod (Nov 19-20). Ralph welcomes opportunities to preach or bring greetings during a worship service, as well as opportunities to visit Session and Deacon meetings. Schedule a Sunday or a meeting time by contacting him at 724-528-1610 or ralph@shenango.org. – TE Bill Crooks and the Trinity congregation are celebrating 35 years of installed ministry together this month. – TE Kang Na (Westminster College) has been added by our Committee on Ministry to the approved pulpit supply list, available on our website. – TE Mark Frailey was installed as pastor of Coolspring church on Sunday, October 18, by a commission elected in September. – TE Tom Clyde’s (Beaver-Butler presbytery) contract to serve the Ebenezer church part-time was renewed by the session and approved by the COM. – Rev. Rob Guy (Church of God) has been hired half-time by the Wurtemburg church and has been approved by a subgroup of our Committee on Ministry to labor within our bounds. Rob is a PhD candidate in History and Divinity at Kings College, University of Aberdeen. – Ray Medina, candidate for ordination under care of the Presbytery of San Francisco, has been called by the Bell Memorial church and will examined for ordination at our November 17 stated meeting. Should the way be clear, his first Sunday at Bell Memorial will be November 22. – TE Matthew Camlin has been called by the New Wilmington church and will transfer from the Upper Ohio Valley presbytery. Rev. Camlin’s first Sunday at New Wilmington will be December 6. – The Jamestown session recently voted to place the question of dismissal to another Reformed body before the congregation again on November 15. The first vote, a year ago, failed at 61%. – A Pastor Nominating Committee remains active at the Faith church. Rev. 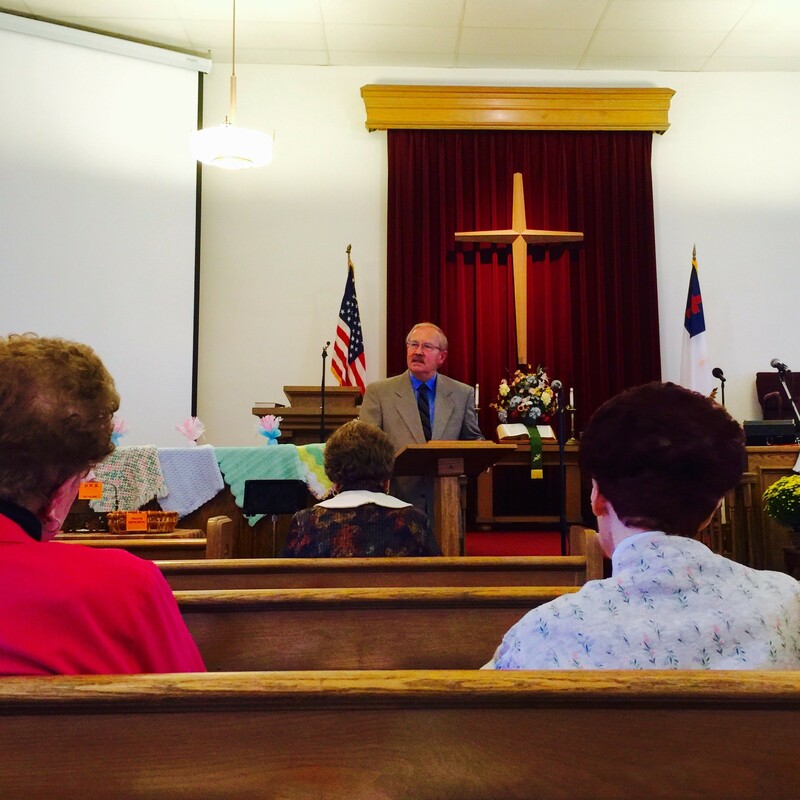 Bob McCreight (shown here) brings a meditation from scripture during the fall gathering of Shenango’s Presbyterian Women, held at the North Liberty Church, where Bob serves as pastor. The day was filled with scripture, prayer, music, and mission updates. The spring PW gathering will be Saturday, April 16, 2016. Mt. Hermon Presbyterian Church (3116 Frew Mill Road, New Castle) will celebrate their 175th Anniversary on Sunday, November 8th with a special worship service at 11:00 AM. Special music by “The Walkers” will be featured, and the service will be followed by light refreshments. Please join them, you are a blessed part of their history. Any questions, contact Karen Lynn at 724-924-9431.